NOTION Music Forum • View topic - Going to buy a new Sting Library. Considering LASS...? Going to buy a new Sting Library. Considering LASS...? Surfwhammy wrote: Based on the information you provided, you can upgrade the system memory on the newer 13" dual-core i5 MacBook Pro to 16GB, which will help . . .
"MacBook Pro with Retina display comes with 8GB of 1600MHz memory as standard. Please note that the memory is built into the computer, so if you think you may need more memory in the future, it is important to upgrade at the time of purchase." So upgrading the memory is not an option on this instance. It's definitely a memory problem as it stands because if I purge the memory on my Mac so it's starting with a clean slate and then run Notion, by the time the EWQL samples have been loaded my memory usage is 7.6Gb. Ha! That leaves 400Mb of RAM to play with which then maxes out if I press the play button. I'm therefore looking at the MacMini and iMacs as a replacement machine. The Mac Pro is out if the question at this time as it's soooooo expensive, but I may instead just wait 6 months or so and go for that instead. Regardless, it clearly means spending money on a new machine. Like I said, I don't need to "render" a uber high quality version yet as I haven't even finished my symphony(! ), but it would have been nice to do so to show friends of my progress etc. but, I can wait. I'll just concentrate on the composition for now using Notion's sounds for playback, which are completely capable for that task. Thanks again to all your help. I'll keep you posted when I update my machine as to how the EWQL library them loads. You are correct about the current MacBook Pro (11,1 and 11,2) and the previous MacBook Pro models (10,1 and 10,2) . . . If your MacBook Pro is one of those models, then there appears to be no upgrade option, which is annoying for two reasons, primary of which is that most people do not know how much memory is required for certain types of computing, hence they essentially are punished for not knowing something, which I think is sneaky weaseling. The other reason is that Apple charges the full amount of a third-party upgrade to 16GB but provides no credit for the 8GB that is included in the base price, although this is consistent with what Apple always has done with its branded memory and is the reason that there is a third-party memory market fo Apple-compatible memory . . .
markodarko wrote: It's definitely a memory problem as it stands because if I purge the memory on my Mac so it's starting with a clean slate and then run Notion, by the time the EWQL samples have been loaded my memory usage is 7.6Gb. Ha! That leaves 400Mb of RAM to play with which then maxes out if I press the play button. There are some buffer parameters for the EWQL Play 4 engine, as is the case with NOTION 4, and adjusting them might provide a bit of help, but if you have a lot of instruments in the NOTION 4 score, the only way I know to solve the problem within the 8GB system memory constraint is to have a separate NOTION 4 score for small subsets of the EWQL instruments, which might be so small as just one EWQL instrument per NOTION 4 score, along with a few NOTION 4 native instruments to provide aural and visual cues to the different sections of the song, symphony, or whatever the composition happens to be, noting that I use this technique to make it possible to have hundreds of VSTi virtual instruments for Pop songs, since regardless of the computer hardware, (a) there are limitations and (b) layering is the classic and historically proven strategy for doing things that basically cannot be done by thinking "inside the box" . . .
For example, I like to use a technique that I call "sparkling", which is a way to cause the notes played by a single instrument to appear in different panning locations along the "rainbow panning arc", where this is a way to add motion to the notes played by an instrument. 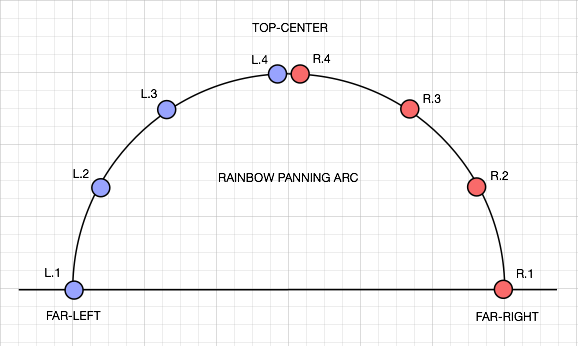 The practical upper limit for simple "sparkling" is eight (8) panning locations, and this maps to using eight (8) NOTION 4 staves, where each staff is panned to a specific location. 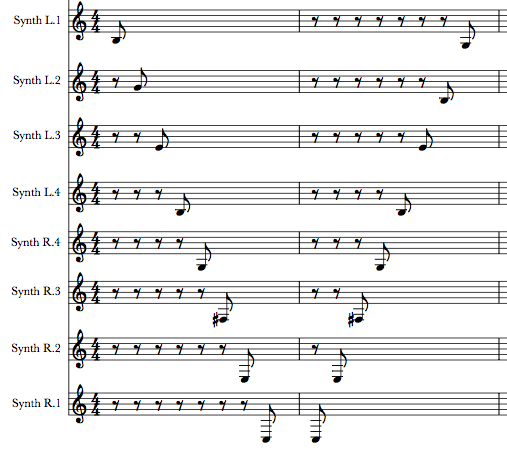 This is accomplished by moving individual notes to different staves, depending on where the notes need to be heard; and it takes a few hours to "sparkle" the notes for a single instrument on a Pop song that runs for approximately three (3) minutes, which is fine with me because (a) it is very precise and (b) it is the only practical way to do it . . . This is a complete song that has a lot of "sparkled" instruments, and everything except the singing is done in NOTION, but I did the producing, mixing, and mastering in Digital Performer (MOTU). It spanned quite a few NOTION scores, each of which was rendered and recorded as soundbites in Digital Performer in ReWire sessions, where the workflow difference is that once the first NOTION score is completed and recorded as soundbites in Digital Performer, the audio for the first set of instruments then is supplied by Digital Performer and then next set of instruments is composed in NOTION, which works nicely on the Mac. If I need to change something in an already recorded instrument, then I switch to that NOTION score and make the change, followed by recording the newly generated audio as a soundbite which replaces the earlier soundbite, but obviously it is best to get it right the first time, which is what I make a diligent effort to do. I keep all the NOTION scores for a song in the same folder, and this make it easy to keep everything organized. No matter how much time it takes, it is faster and less expensive that doing it work real instruments, plus it costs less, which is what makes it practical . . .
markodarko wrote: I'm therefore looking at the MacMini and iMacs as a replacement machine. The Mac Pro is out if the question at this time as it's soooooo expensive, but I may instead just wait 6 months or so and go for that instead. Regardless, it clearly means spending money on a new machine. Based on the current models, you can have 16GB of system memory on a quad-core i7 mac Mini, but you can have 32GB of system memory on a 27" quad-core i7 iMac . . .
A reasonably maxed Mac Pro with a 27" Apple Display costs approximately $10,000 (US) which is three times what a maxed 27" quad-core i7 iMac costs, and for audio work the iMac will be more than sufficient and quite peppy . . .
if necessary, you could get a second 27" iMac and run Vienna Ensemble Pro 5 (Vienna Symphonic Library) on it to create a streaming audio server for the EWQL virtual instruments, which in turn will feed the first 27" iMac where you are running NOTION, but you also can do this with a single Mac Pro, and the Mac Pro can have 64GB of system memory, so it depends on several factors, including your budget . . . However, since you have a nice display, a quad-core or 6-core Mac Pro with 16GB of memory and a 256GB PCIe SSD drive is a possibility if you have some external hard drives and perhaps an external SSD drive, but it depends, since in this instance I continue to prefer the maxed 27" quad-core i7 iMac for approximately the same cost . . .
From my perspective, the easy way to determine whether you need a Mac Pro is based on what you plan to do . . . If you plan to do extensive animation and video work, then you need a Mac Pro with every possible hardware option; but if you are doing digital music production, then at present I like the 27" quad-core i7 iMac with 32GB of memory and the largest internal SSD drive, plus an external SSD drive with a Thunderbolt interface--noting that based on the best information I have been able to find, Fusion drives do not work well for digital music production . . .
markodarko wrote: I don't need to "render" a uber high quality version yet as I haven't even finished my symphony(! ), but it would have been nice to do so to show friends of my progress etc. but, I can wait. I'll just concentrate on the composition for now using Notion's sounds for playback, which are completely capable for that task. Last edited by Surfwhammy on Sat Jul 05, 2014 5:38 pm, edited 1 time in total. Apple has announced the next version of Mac OS X--which is called "Yosemite" and will be released this fall (2014)--and this probably will affect something, although at present I have no idea precisely what that might be, other than I probably do not need most of it . . . If there are reliable sources for used Mac Pro computers in your area, that might be a possibility, since everything is working nicely on the 2.8-GHz 8-core MacPro (Early 2008) with 20GB of system memory here in the sound isolation studio . . . In the US, I like PowerMax for used Mac Pro computers, and they have an extended warranty option . . .
And there probably will be a new version of NOTON and the EWQL Play engine sometime in the not so distant future, as well, although this is just a bit of guessing, since I have absolutely no specific information in this regard . . . If it is possible to upgrade all of these, then you only need to determine which one is the culprit when a computer is too slow or unable to perform a necessary task, but it works a bit differently when only some of the components can be upgraded . . . If the Mac universe, if the processor is too slow, for the most part you need to get a new computer with a faster processor, although if the motherboard is designed for dual processors and you currently have only one, then it might be practical to add a second processor, but perhaps not, and I have no experience with this in the Mac universe . . .
On a Mac Pro, you can upgrade (2), (3), and (4), which is nice, and the decision of which of the three to upgrade depends on the specifics, where in some instances everything except the video processor can be peppy, hence sits idle while waiting for the display to paint, in which case upgrading the video processor solves the problem; but for 64-bit applications, I update system memory first when it starts at a lower quantity. After that, it becomes a matter of determining whether upgrading the video processor maps to better performance than adding an PCIe SSD drive, since both of these upgrades tend to be expensive, but it also depends on the type of computing you are doing . . .
(a) System memory is where the audio clips are buffered for immediate use, and Mac OS X and 64-bit mode applications can use all the available system memory productively. The operating system (Mac OS X) uses a good bit of system memory when a machine has 8GB of system memory, which makes the operating system footprint significant, but this lessens as the amount of system memory increases, so that what happens is that beyond 16GB of system memory on a Mac, this shifts the focus to 64-bit applications, although this begins to happen at 16GB of system memory. Using more of the system memory requires changing various buffer parameters for 64-bit applications, hence does not occur automagically, but so what . . .
(b) Data storage and retrieval, as I define it, refers to hard drives, SSD drives, CD/DVD drives, and so forth, but primarily to hard drives and SSD drives, which can be internal or external; and this is where huge amounts of audio data is stored and retrieved, which can include being updated or deleted. SSD drives are considerably faster than hard drives (perhaps 10 times faster), and with anything that needs to happen in real-time, faster is better . . . It is not a matter of one or the other in a mutually exclusive way, because for high-resolution sampled sound libraries with a virtual festival of articulations, dynamics, playing styles, and so forth, it might require upgrading system memory and data storage devices to get optimal performance; and this also depends on the processor(s), although not so much on the video processor(s) . . . When I purchased the Mac Pro here in the sound isolation studio, it was the basic but peppy dual-quad model, and it had 2GB of memory (2x1GB), which I upgraded to 8GB by adding three (3) more 1GB matched pairs. It was the previous model at the time but only by a few days, hence it was discounted at Amazon.com by eight (8) percent for a few hours only, which was smart shopping on my part, since at the time Amazon.com was able to sell basic Mac Pro computers and typically discounted the current model for a few hours at a time during the week before a new model was released, which is fine if you can do upgrades after the fact . . .
People who only have used Apple computers tend to believe that it is blasphemy even to contemplate tinkering with the hardware, but I started in the Windows universe and am unencumbered by such beliefs . . . The system memory is manufactured in same manufacturing plants, and if it works for a week, it probably will work forever, hence having the Apple logo stamped on the memory means nothing to me . . . In the Windows universe, disassembling the computer and reassembling it is one of the "fail safe" troubleshooting protocols, which if that does not work is followed by banging on the case with a hammer while rapidly toggling the ON/OFF power switch, with this latter "fail safe" strategy being handy as the response to the appearance of the message "Your computer hard drive has failed catastrophically. All your data is gone. Press 'OK' to continue", noting that this message only has an "OK" button. When this happens, you need to turn the power switch OFF and then you can grab a hammer and proceed. Curiously, this actually solves the problem, provided you are somewhat gentle with the hammer banging, which as best as I can determine unsticks the lever in the hard drive that moves the read-write head. This is more of a gift than anything else, and I call it the "touch", where it is a fact that a person who has the "touch" can fix electromagnetic devices this way in some instances, at least for a while, which is fabulous . . .
On my Windows machine I can (just!) get by with the 8GB memory I have loading the Notion template for the (Full) EWQLSO. That is with nothing!!! _else running at the same time. Not sure why. I think it could be that Windows use "Dynamic Memory Allocation". I'm really not sure. Another option would be to upgrade to EWQLSO Platinum plus so that you have the 16bit version of all the instruments as well as the 24bit. 8GB should be fine for loading that. Also, the "lite" patches in the Notion EWQLSO instruments are not that lite, and may be just fine for you purposes. Certainly way better then the Notion sounds. Johnny wrote: On my Windows machine I can (just!) get by with the 8GB memory I have loading the Notion template for the (Full) EWQLSO. That is with nothing!!! _else running at the same time. It will be a bit different in the Windows universe, which is the reason that I made an effort to be clear that it is not an "either or" type of problem in a mutually exclusive way in the sense of being either (a) system memory or (b) SSD drive but not both (a) and (b) . . . Depending on the type of processor(s) your WIndows machine has, this can make a difference, as well, even though it is not a processor issue, per se . . . If you have a quad-core processor and the EWQL Play 4 engine can do a bit of multi-core work when it is hosted by NOTION 4, this makes the processor core cache (another type of "look-ahead" buffer) available . . .
Mostly, it is a matter of moving stuff from a big bucket (the entire EWQL sampled sounds libraries) into small buckets (NOTION 4 audio buffer and Play 4 engine buffer[s]), and so long as the small buckets always have the specific samples when NOTION 4 needs them to generate audio, everything will be fine . . . Your SSD drive(s) certainly will be considerably faster than a hard drive, so if the "big bucket" can get stuff into the "small buckets" faster, this is a possibility; and it obviously is working for you on your Windows machine with 8GB of system memory, which is fabulous . . .
wcreed51 wrote: Another option would be to upgrade to EWQLSO Platinum plus so that you have the 16bit version of all the instruments as well as the 24bit. 8GB should be fine for loading that. Also, the "lite" patches in the Notion EWQLSO instruments are not that lite, and may be just fine for you purposes. Certainly way better then the Notion sounds. I like this, which is fabulous . . .
Surfwhammy, for your "sparkles" effect, would it perhaps be easier to move the composition over to a DAW for mixing and then draw different panning points? I do have the Platinum Plus (16/24 bit) EWQL libraries incidentally, but for the life of me I couldn't work out how to select them in Notion. In Logic X it's easy as the Play window pops up, but if I add instruments from the EWQL instruments list in Notion I don't get any Play window. Clearly I'm doing something wrong. As for the Lite instruments, you're right, I can see that the Violins - for example - load both the 18 and 11 sets, which can't be right(!). But have no idea if that's the string package that I'd need. My main problem with Notion's built-in instruments is that they don't respect articulations like sfz or fp and I'd hope that THAT bundle would, but, until I get a new machine there's no real point me getting ANY new library really. Whilst on the VSL subject, I notice that in Notion there are options for the VSL and VSL "Pro" instruments yet I could find no such "pro" strings bundle. Does the "pro" just refer to the pro sample player, and not a different library? If so, as a matter of interest, what benefits are there to getting that in Notion? The full orchestra loads here with only 8GB but!! I only have 15% memory leftover. But it works I'm happy to say. The VSL Pro is for the VI Pro player, as opposed to the free VI player that comes with their libraries. I don't have Platinum plus, co can't advise, but I'm sure if you contact support they will help you use the 16bit version of EWQLSO. You already own so why not get it working!